No refunds will be given for bookings cancelled within a week prior to their arrival. Welcome to Shoreditch! We are all about East London. Our hostel is located in the capital’s coolest district, where cool East meets old school Central London. This area is famous for its alternative culture and hipster style. 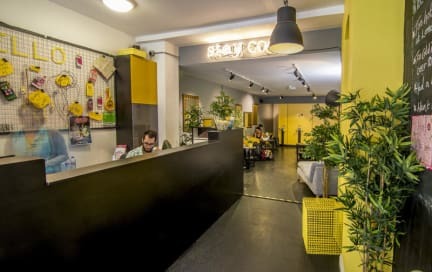 The hostel is located just meters away from the bustling Shoreditch High Street – home of London’s coolest bars, clubs, restaurants, galleries and independent shops. We even have our own bustling on-site bar. Brick Lane, Spitalfields Market, Columbia Road and The Old Truman Brewery are all within walking distance of the hostel. We are even near a couple of Banksy pieces! What’s more, we’re only bus trips away from the Tower of London, Oxford Street and Covent Garden. 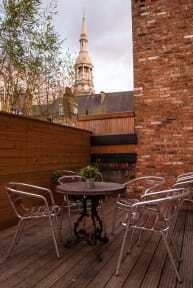 The hostel is housed in a converted, Victorian-era warehouse and has a wonderful industrial feel. Perfect if you’re looking for something with quirky style and an independent vibe. We don’t like to brag, but we do have it all: awesome staff, free wi-fi, 24 hour reception, free basic breakfast, roof terrace, self catering kitchen, bustling on-site bar, table football, and a coffee shop. We provide free luggage storage for you on the day of your arrival and check-out. There’s even a 20% guest discount in the bar & cafe too!